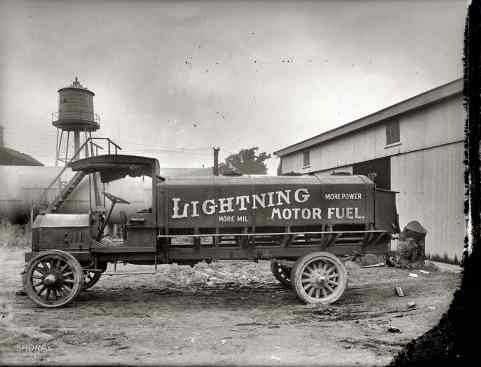 Washington, D.C., Penn Oil and truck. A relic of the Carboniferous Age. Ilargi: Or the rabbit in the hat. The next trick being pulled out is called Ginnie Mae. The show must go on. Maybe they'll just let Fannie and Freddie expire. Like GM, simply pull the plug. I have nothing much today, other than I'm going to sit outside and work on my tan with a book and a beverage. Ain't nobody can call ME Dr. Doom. General Motors Corp.bondholders may lose as much as 73 percent in the event of a default by the world's biggest automaker, based on the price of contracts used to fix a recovery value for the securities. The recovery swap rate on GM dropped to 26.5 percent, from 39.5 percent at the end of June, meaning investors expect to get only 26.5 cents on the dollar in an insolvency, CMA Datavision pricing models show. Investors are pricing in a lower recovery rate than the average of 40 percent in bankruptcies as capital is eroded by $69.8 billion of losses since 2004. "GM is on the highway to hell, there is no signal there is a way out for them," said Jochen Felsenheimer, the Munich-based head of credit strategy at UniCredit SpA, Italy's biggest bank. "Recovery on GM might be significantly below 40 percent." GM's $29 billion of debt was downgraded by Moody's Investors Service this week to Caa1, a category for borrowers that may be in default or show "elements of danger." The cost to protect the bonds using credit-default swaps indicates an 88 percent risk of the Detroit-based company reneging on its obligations within five years, compared with a 77 percent risk for competitor Ford Motor Co., according to Bloomberg data. Falling U.S. sales and the declining value of truck leases caused GM to report the third biggest quarterly loss in its 100- year history on Aug. 1 at $15.5 billion. The company, which says it must have $11 billion to $14 billion each month to pay its bills, burned through $3.6 billion in the second quarter. Chief Financial Officer Ray Young said this week he's trying to reap more of the $10 billion in projected savings from capital-spending reductions and cutbacks in the salaried payroll for this year instead of in 2009. Holders of recovery swaps agree in the event of a default to exchange a preset fixed rate for the actual amount recovered by bondholders. The investor receiving the fixed amount will benefit if the payment recovered by bondholders is lower than the rate agreed. Banks offer contracts on about 55 companies that are considered to the highest risk of default, including U.S. mortgage insurer Radian Group Inc., bond insurer MBIA Inc. and automaker Ford. "Trading of recovery swaps on GM has picked up, especially over last couple of weeks," Felsenheimer said. Ford, the second largest U.S. automaker, shows the same recovery rate at 26.5 percent, down from 37 percent at the end of June, CMA data show. Combined with Chrysler LLC, the probability that one of the three car companies will be unable to fund its business over the next five years is more than 95 percent, Felsenheimer wrote in a note to investors last week. The cost of credit-default swaps on GM soared to $4.3 million upfront and $500,000 a year to protect $10 million of bonds, up from a total of $642,000 a year in May, CMA data show. Credit-default swaps, contracts conceived to protect bondholders against default, pay the buyer face value in exchange for the underlying securities or the cash equivalent should a company fail to adhere to its debt agreements. A rise indicates a deterioration in the perception of credit quality; a decline signals the opposite. Credit-default swaps are priced on an assumed 40 percent recovery rate. Sellers of debt protection use recovery swaps as a hedge against recouping less than 40 percent. Recovery rates are likely to fall as the economy weakens, said Matt King, head of quantitative credit strategy at Citigroup. "Recoveries tend to be lower in recessions largely because there are more defaults," said King. "With more defaults, there are more companies trying to sell assets to work their way out of difficulty. With so many assets up for sale, the price of those assets tends to be driven down." Inflation could drop to below 1 per cent next year as the slump in oil prices and the weight of the economic downturn drag price rises into negative territory, it has been warned. Tim Congdon, the prominent analyst who set up Lombard Street Research and has advised previous governments, said the Consumer Price Index could come down "very sharply" from its current heights. The prediction comes after the CPI scaled a 12 year record of 4.4 per cent last week and the Bank of England forecast that it would reach 5 per cent. It is given added weight because Congdon predicted a year ago, when inflation was close to the Bank's 2 per cent target and almost every other economist expected it to remain there, that the CPI could rise to 4 per cent or 5 per cent this year. However, Congdon said a number of signals, including a sharp fall in money held by companies, suggested that the increase would be short-lived. "Although there is bad inflation news around, there isn't much [the Bank of England] can do - it is too late," he said. "But if they look ahead to late 2009, the impact of the oil increase on the indices will be replaced by the impact of the oil price coming down. You will get a very low inflation figure in autumn 2009. It isn't inconceivable that it will go beneath 1 per cent." The warning comes as the Bank prepares to publish the minutes of its Monetary Policy Committee meeting held earlier this month. They are expected to show that, despite the dovish tone adopted in the Inflation Report, Tim Besley was joined by one of his colleagues on the committee in voting for higher borrowing costs. However, with markets pricing in a 50 50 chance of a rate cut in November, the likelihood that Besley will secure a majority remains slim. Congdon said: "Although the inflation figures were bad, the next move in interest rates should be down. At the moment the money numbers are very worrying. There is undoubtedly a corporate liquidity squeeze." Many economists, including Congdon, warned the Bank two years ago that it needed to do more to clamp down on potential inflation, basing this advice on the rise in the amount of money in the economy. Most measures of money growth have dipped markedly since the onset of the credit crunch. The Bank drew attention to the more recent fall in broad money in the Inflation Report, pointing out that the amount of cash held by private non-financial corporations was now falling on an annual basis. It said: "The sharp decline in growth rates corroborates the message from the Bank's Credit Conditions Survey and elsewhere that a marked tightening in the supply of money and credit is under way, as financial institutions deleverage. If that were to accelerate, that would pose downside risks to the outlook for nominal spending. "The MPC will continue to monitor developments in money and credit growth closely." A recent story covering the growth of Lenders One, a nationwide cooperative comprised of independent mortgage bankers, had us thinking about the origination mix reported by the company, which said it originated more than $3 billion during a 30-day period. That mix: 43.5 percent to the FHA, only 5.3 percent jumbo, Alt-A or second mortgage products, and the rest in conforming product. You’d have to have been in the origination business (or known some people who have) to appreciate that statistic — nearly half of originations went to FHA, and by extension to oft-forgotten Ginnie Mae. But a review of month-to-date issuance volume by HousingWire, using data provided courtesy of eMBS, Inc., suggests that Ginnie Mae won’t be playing third fiddle to its two better-known siblings for very long. In fact, the explicitly government-backed mortgage operation soundly trumped Freddie Mac in fixed issuance during July, a milestone that few market participants seem to have noticed: $24.9 billion was issued via Ginnie during the month, compared to $20.3 billion at Freddie. It was the first time Ginnie’s fixed issuance had been above either Freddie or Fannie Mae in recent memory, and certainly the first time in the fours years’ worth of data reviewed. 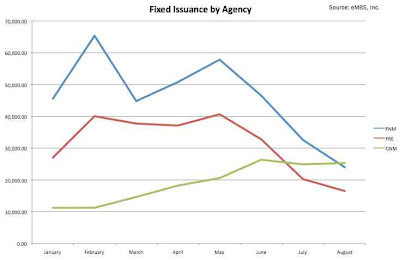 But August, at least so far, is shaping up to be a historic month that could mark a clear turning point in our nation’s debate over mortgage financing’s future: that’s because, to-date in August, Ginnie Mae’s fixed issuance is ahead of both better-known GSEs. According to eMBS’ data, Ginnie Mae has issued $25.3 billion to date, while Fannie and Freddie have issued $24.0 billion and $16.5 billion, respectively. Imagine a world where the leading GSE isn’t named Fannie Mae or Freddie Mac; and if you’ve been in the mortgage business for any meaningful period of time, it’s an amazing thing to consider. We’re talking about an agency whose monthly issuances as recently as late last year were just 25 percent of Freddie’s volume — and that was in a good month. The speed of the market shift has been just as stunning, as well: in February, for example, Ginnie’s issuance total was just 17 percent of that recorded by Fannie Mae. My, how the tables have turned, especially as both Fannie and Freddie have run into problems of their own as of late; and expansion of the FHA’s role by lawmakers hasn’t hurt either. The Economic Stimulus Act of 2008 allowed FHA to raise its loan limits from $362,790 to $729,750 in some areas of the country. The increase is one of a few key areas of legislation that has had major impact favoring a revitalization of Ginnie — in the four months since Ginnie Mae rolled out its new jumbo loan product, issuers have securitized $17 million in April, $331 million in May, $1.089 billion in June, and $1.470 billion in July of FHA’s jumbo loans. To date in August, eMBS reports that issuers have securitized another $1.952 billion thus far — Fannie and Freddie combined have managed a just $161.7 million thus far, in comparison. An extraordinary Treasury capital infusion may be needed to restore faltering foreign demand for debt issued by Fannie Mae and Freddie Mac, the two top home funding sources that the government is willing to rescue to save the housing market. The companies rely heavily on overseas investment, often up to two-thirds of each new multibillion-dollar note offering, to help pare funding costs and keep mortgage rates low. But foreign central banks have dumped nearly $11 billion from their record holdings of this debt in four weeks, to $975 billion, and won't return in force before it's clear if -- and how -- the government will back Fannie and Freddie, some analysts say. President Bush has already approved the means by which Treasury and the Federal Reserve could bolster these two companies, which both reported greater-than-expected quarterly losses and steps to beef up capital. Fannie and Freddie said they aren't seeking that support and Treasury Secretary Paulson said he isn't offering. The bonds these companies issue in the $4.5 trillion agency MBS market are near or worse than the weakest levels, set in March before the government engineered the sale of failing Bear Stearns to JPMorgan. "People are concerned about whether there's a bailout that's going to be coming from the U.S., so it would be logical to see foreign investors pull out of agency paper," said Kevin Chau, forex analyst at IDEAglobal in New York. "They don't know whether the U.S. is going to be committed to supporting the GSEs, and if they are going to support them, by what methods are they going to support them." Overseas investors took an atypical back seat in Fannie Mae's three-year note sale this week. Central banks bought just 37 percent of the $3.5 billion issue, down from 56 percent in May's $4 billion offering of the same maturity. Asia accounts took just 22 percent of the notes, down from 42 percent in May. Freddie Mac will soon also test overseas interest in the $3 trillion agency debenture sector. It announces August note funding plans on Monday. "Most fixed income investors to whom we have spoken believe that a capital infusion by the government into Freddie and Fannie is a prerequisite for turning sentiment around in mortgage-backed securities and, by extension, in the broader fixed income markets," Barclays Capital analysts Rajiv Setia and Philip Ling wrote in a report. A $10 billion to $15 billion infusion for each government-sponsored enterprise (GSE) is seen doing the trick. "The longer the debate drags on, the more tentative foreign interest in the sector is likely to become. Even though the GSEs are adequately capitalized, investor confidence has been shaken," the analysts wrote. "A slowdown in international investor interest remains the major risk factor for agency spreads, in our view." As mortgage bonds trade poorly while investors wait for good news on Fannie and Freddie capital, U.S. mortgage rates have climbed to their highest levels in a year. It took severe measures to restore investor confidence at various times during the year. When markets were turbulent in March during the Bear Stearns crisis, Fannie's and Freddie's regulator lifted limits on their mortgage portfolios and lowered the amount of capital they needed to hold. This signaled that the GSEs would be big mortgage buyers, helping stabilize housing and the markets. In June, foreign investment in agencies showed none of the stress seen lately, rising to $31.46 billion from $28.16 billion in May, Treasury data on Friday showed. In July, the Fed and Treasury agreed to backstop the two companies if needed, and Bush approved the measures as part of a new housing act on July 31. However, the initial optimism about the plan has been doused by concern about the government's follow-through. "There's a crisis of confidence" in the two companies, and "we're likely to see renewed flows into Treasuries and perhaps some high-quality U.S. corporates" instead, said Michael Woolfolk, senior currency strategist at Bank of New York Mellon. The United States has become dependent on foreign investors buying dollar-denominated securities en masse, lowering borrowing costs for various consumer loans and stimulating the economy. But with housing in its biggest slump since the Great Depression, and banks burned by record foreclosures making it harder to get loans, more extreme steps are needed to assure investors. "It would take something dramatic for there to be a material improvement in the confidence necessary to bring foreign investment back to these agencies at the levels we've become used to," Woolfolk said. "There is the hope that's held out by some for a magic bullet, and that could take the form of a sizable infusion of capital or perhaps a complete rethink of restructuring both of these GSEs," he said. "If not the cash injection, then (we need) an overhaul." The two biggest sources of mortgages for U.S. home buyers plan to raise their base fees to counter continuing "adverse conditions" in the real estate marketplace. At the same time, however, Fannie Mae and Freddie Mac, which fund more than three-quarters of new home loans, also plan to selectively cut fees for applicants whose likelihood of default and foreclosure appear to be lower than previous estimates. The changes are being driven by risk-based pricing. Factors such as credit scores, down-payment size and the type of loan you seek can push expenses on a new mortgage up or down tens of thousands of dollars over the term of the loan. As of Oct. 1, for new mortgages delivered to Fannie Mae and Nov. 7 for loans delivered to Freddie Mac, baseline "adverse-market" fees will be doubled from one-quarter to one-half of a point—to $500 per $100,000 borrowed, from $250. That applies to all home purchasers and refinancers. The higher fees will be paid upfront by borrowers or folded into the interest rate on their notes, adding about an eighth of a point to the rate. Though the higher fees do not kick in until the fall, major lenders already are incorporating them into quotes. Neither company issued announcements of the jump in fees to the general public, but sent e-mail bulletins to lender partners. On the flip side of the higher baseline costs is a series of risk-based pricing changes keyed to borrowers' scores and down payments. Both companies plan to reduce fees for borrowers with high FICO credit scores—720 and up—who make down payments of less than 15 percent. These borrowers will be quoted credits of one-quarter of a point—amounting to cuts in their fees—when they apply. At the same time, borrowers with FICO scores less than 720 and down payments of less than 15 percent will be charged quarter-point higher fees upfront. Why? Credit scores never have been more powerful in determining the rates and fees home buyers pay—at a time when standards are being ratcheted up. In the housing boom, the dividing line between subprime applicants and borrowers deserving better rates was a 620 FICO score. A 700 score was a virtual guarantee of the top quotes, Fair Isaac Corp.'s FICO scores range from about 300—the highest risk—to 850, the lowest. Now even FICO scores above 700 are subject to higher fees in some cases. For example, if you are applying for a loan destined to be funded by Fannie and you have a 739 FICO score and a down payment of 20 to 25 percent, you're likely to be hit with a quarter-point fee increase that you wouldn't have been charged as recently as last month. Fannie explains that a 739 FICO no longer makes the highest grade when the applicant can't put 30 or 40 percent down. Worse, if you've got a FICO score less than 720 without at least a 30 percent down payment, you're going to get hit with a half-point delivery fee. An interesting twist: People making the lowest down payments—but who have credit scores above 720—can expect fee decreases of a quarter of a point. Isn't that counterintuitive, since default risks rise when down payments are smaller? Yes, but in Fannie and Freddie's worlds, all loans with 20 percent or lower down payments require private mortgage insurance to protect the companies from the deepest losses associated with foreclosures. So both have decided they can charge a little less on such loans. That's good news for moderate-income first-time buyers with sterling credit who don't have a lot of cash. Not coincidentally, both companies are mandated by Congress to serve such creditworthy buyers, many of whom have lately been turning to the Federal Housing Administration for lower-cost, low-down-payment mortgages. U.S. builders began work in July on the fewest houses in 17 years and the economic outlook dimmed, indicating the real-estate slump is at the epicenter of the growth slowdown, economists said before reports this week. Housing starts plunged 9.9 percent to an annual rate of 960,000, according to the median estimate in a Bloomberg News survey ahead of a Commerce Department report on Aug. 19. The Conference Board's index of leading indicators probably fell 0.2 percent last month, a third consecutive drop. Stricter lending rules, rising borrowing costs, falling property values and record foreclosures may further depress home sales and cause builders to keep retrenching. Housing, job losses and the credit crisis are likely to weaken the economy for the rest of the year and into 2009. "There's no underlying support for the housing market," said Adam York, an economist at Wachovia Corp. in Charlotte, North Carolina. "The economy as a whole is in fairly poor shape." The leading indicators index, a measure of the economy's likely path over the next three to six months, is due for release on Aug. 21. Commerce's housing report may also show building permits, a sign of future construction and a component of the leading index, fell 15 percent last month, according to the Bloomberg survey. A change in New York City's building code that took effect July 1 caused housing starts and permits to unexpectedly surge in June as builders broke ground ahead of the new regulations. The magnitude of the projected July drop in starts and permits reflects, in part, "a payback from the big jump" the month before, York said. Underneath the gyrations, demand continues to weaken. Existing home sales fell to a 10-year low in the second quarter and the median price for a single-family house slid 7.6 percent, according to the National Association of Realtors. A third of all sales were foreclosures or "short sales," in which lenders take a loss on a property. To make matters worse, financing is also becoming scarce, a quarterly survey of banks by the Federal Reserve showed. Three- fourths of the loan officers polled reported they tightened standards on prime mortgage loans, up from the April survey. Lending rules on non-traditional loans were also toughened. The five largest U.S. homebuilders reported a combined $1.08 billion in losses in their most recent quarters. Builders are understandably downbeat as the losses mount. The National Association of Home Builders/Wells Fargo's sentiment index may show optimism held at a record low in August for a second month, economists forecast a report tomorrow will show. Still, construction companies are making some headway in reducing the supply glut. The number of new homes for sale dropped in June by the most in four decades. Some firms are seeing an improvement. Toll Brothers Inc., the largest U.S. luxury homebuilder, reported cancellations last quarter dropped to the lowest level in more than two years, and said buyers are starting to return to the market. "There is growing pent-up demand from those who have postponed buying during the past almost three years," Chief Executive Officer Robert Toll said on an Aug. 13 conference call. Finally this week, a Labor Department report Aug. 19 may show wholesale costs rose at a slower pace last month as fuel expenses peaked. The producer price index probably climbed 0.5 percent in July after jumping 1.8 percent the prior month, according to economists surveyed. The economic news in the coming week will probably confirm just what you'd expect: higher prices, weaker home building and a Federal Reserve that's stuck in a tricky position. The calendar of economic releases is fairly light. The most interesting event of the week could come on Friday when Fed Chairman Ben Bernanke speaks at the annual conference in Jackson Hole, Wyo., on financial stability. The data should contain few surprises: July was probably another bad month for inflation and home building. The good news may be that builders didn't feel any worse about their business in August. "The sad reality is that no one expects good news on the housing market," wrote Meny Grauman, an economist for CIBC World Markets. Real estate "remains a basket case." Economists surveyed by MarketWatch expect a big drop in housing starts in July to a seasonally adjusted annual rate of 960,000 from June's 1.07 million. The figures will be released Tuesday. June's number was boosted by a technical quirk, the result of a new building code in New York City that encouraged developers in the city to rush to file their building permits ahead of the new rules. July's figures should see both housing starts and building permits to come back to earth. In the key single-family home-building segment, starts have plunged 65% from the peak, and building permits are down 66%. Some folk have argued that construction usually doesn't fall more than that during corrections, so we must be near the bottom. But there's no reason to think history will trump the fundamentals: There are just too many homes for sale in most markets. There's an "ongoing need to pare back construction activity in light of bloated inventories of homes on the market," wrote economists for Barclays Capital. The home builders' sentiment index probably remained at a record low of 16 in August when it's released Monday, economists said. While the new housing relief law might be expected to jump-start the industry a bit, mortgages are still expensive and hard to get, said economists for Wachovia. "We still believe it will take another year before we see a positive contribution to overall economic growth from the residential construction sector," Wachovia's economics group said. Higher energy prices probably sent the producer price index up 0.5% in July, after a 1.8% increase in June (the second-biggest increase in 18 years). Core prices (which exclude food and energy) probably rose 0.2%, economists said. The figures will be released on Tuesday. The PPI probably won't attract the usual level of scrutiny this month, because the more-important consumer price index has already been released. The CPI rose 0.8% in July. Wholesale energy prices were mixed in July, said economists for Lehman Bros. Petroleum-based products declined slightly, but natural-gas prices rose. Wholesale food prices also rose, Lehman Bros. economists said. The core PPI should be helped by further declines in light truck prices, said David Greenlaw, an economist for Morgan Stanley, who expects moderation in prices for crude materials and intermediate goods due to the declines in commodity prices. It'll take another month or two for the lower prices to show up at the wholesale or retail levels. Bernanke will kick off the annual seminar at Jackson Hole on Friday morning. The timely theme for this year's gabfest is financial market stability. Although the papers are typically academic in nature and don't directly address the question of what the Fed should do next, "the press is likely to dig deeply into the speech for headlines," said Lehman's economists. "We do not expect Bernanke to signal a change in the Fed's policy bias," the Lehman economists said. "The Fed is firmly on hold as it worries about both high inflation and weak growth." The foreclosure filings piling up across the country are taking a toll not just on banks and Americans' personal finances, but on their mental state as well. Nearly 1.7 million homes have been foreclosed upon so far this year, and the pace has accelerated. RealtyTrac reported on Thursday that there were 55% more foreclosure notices issued in July than a year earlier. The related stress can lead to an increase in unhealthy behavior, like not eating or sleeping properly, self-medicating with alcohol or drugs, and damaging personal relationships or employment. Some have even taken their own lives. One couple facing foreclosure in Prineville, Ore., left their car running to kill themselves and their three dogs, according to a USA Today article. ABC News reported that another woman in Massachusetts fatally shot herself after faxing her mortgage company a note saying that "by the time you foreclose on my house I'll be dead." While these may be extreme examples, there is no doubt that the economic downturn is causing mental anguish for Americans across the board, and that those who are in danger of losing their homes are likely to be hit the worst. ComPsych, a Chicago-based provider of employee assistance programs, says it received 21% more calls related to finances during the first six months of the year, with eviction calls up 25%. The company has added more on-site training sessions for personal finance to help employees cope with financial stress. "Our experts say this is being driven by economic hardship and uncertain times," says spokeswoman Jennifer Hudson. Karl Frank, a financial planner with A&I Financial Services, has seen three of his clients go through the painful twists and turns of losing their most valuable asset, with different results. One couple, Sally and Mike, purchased a $500,000 home with no down payment as the Denver area was approaching the peak of its real-estate boom. Sally was a part-time employee and Mike was a full-time government worker, and their cumulative salary totaled less than $100,000 per year. Soon the interest rate started to balloon, and with one child in college, and another two approaching college age, the couple sold their home at a loss and pulled out all the funds from their retirement accounts and "lost 40% to Uncle Sam" on those assets, Frank says, due to early-withdrawal penalties. Sally got a second job to make ends meet. "Colorado real estate was going so well and they got into a home they just didn't belong in," Frank says. "Their lifestyle went from living the good life, living the dream to just depression. They're still kind of struggling with that, but we kind of lost touch because they no longer have an account with us." On the other end of the spectrum was a school administrator who earned $150,000 per year and planned to profit from the local real-estate boom. He acquired rental properties, and purchased an $800,000 luxury home. He spent another $200,000 to improve the house, which was in the popular neighborhood of Harvey Park near the University of Denver. He planned to sell it for $1.4 million. Unfortunately, 40 other homes in the neighborhood went on sale at the same time, saturating a housing market where consumers had little appetite or capacity to purchase them any longer. His realtor now estimates he might sell the home for $750,000. The value of his rental properties declined sharply as well. To make matters worse, Frank's client lost the job he had been in for more than three decades. (Frank declined to provide his name, citing privacy concerns.) A business coach suggested he take his severance package and take a six-month vacation, which he plans to embark on shortly. "It's terrible," says Frank. "He's just under water and he's just going to let the thing go under foreclosure. He's not broke but because of the stress, he lost his job, too." The American Psychological Association provides tips for those coping with such financial anxiety. The group suggests that you don't overreact to a bad situation, but also don't become passive. It's important to identify the key problems, formulate a plan and stay focused on improvement and long-term goals despite short-term problems or pain. If you find yourself moving toward unhealthy behaviors -- smoking, drinking, drugs, gambling or emotional eating -- consider seeking help from a mental-health specialist before it becomes a serious problem or causes damage to your personal relationships or job. Credit counseling services and financial planners can also help in times of economic stress. And on the bright side, the APA notes, "times like this, while difficult, can offer opportunities to take stock of your current situation and make needed changes." Frank provides another example of a couple who lost their property but are turning the lemons into lemonade. Kurt -- who works for a homebuilder -- and his wife Jackie owned one home in the Denver area, along with a vacant piece of property. They planned to build a $1.5 million house on the lot that would only cost about $200,000 to build because of Kurt's homebuilder connections. However, the tight credit markets made it impossible for the couple to obtain a construction loan. They were forced to sell their $450,000 primary residence at a loss when the interest rate reset at a higher rate and Kurt stopped receiving his annual bonus amid the housing-market downturn. Although it caused much stress in the family, they are now renting, thankful that Kurt still has his job, and are holding onto the lot to build their dream home when market conditions improve. "Sometimes having a dream like that can offset the depression and frustration you feel with something else," says Frank. "And if you can take comfort, you're in good company: You've got multimillionaires who are foreclosed on and you've got some real-life folks." After six months of falling prices, a rising tide of repossessions and the prospect of millions of families slipping into negative equity, the Governor of the Bank of England, Mervyn King, said yesterday that there was little the authorities could do to prevent a housing crash, if that is what the market demanded. During a press conference to launch the bank's Inflation Report, Mr King said: "It's hard to judge where prices may go... We are in a period where prices are adjusting to new levels. Buyers and sellers are struggling to find out what that new level is. The market will determine it, not us or the Government. Once we have reached that level then prices should normalise. But that does not mean back to levels seen early last year that were clearly excessive." His remarks stand in stark contrast to ministers who say they are searching for ways to "rescue" the housing market, most notably through measures such as a "holiday" for stamp duty and an extension of the Bank of England's special liquidity scheme. Reports yesterday suggested that the Chancellor, Alistair Darling, is considering ordering the Bank to extend the scheme, making it easier for the high-street banks to lend. While the Bank is committed to what might be called a "son of SLS", officials have always made it publicly clear that the SLS was never intended to "kick-start" the mortgage market. Yesterday, Mr King reiterated that stance, voicing considerable opposition to any move that would in effect result in the state funding the mortgage market. "Funding is not something the central bank can supply ... It would be a very dangerous move to move to a situation where the Government saw its major role as guaranteeing lending," Mr King said. "Why should the taxpayer take on the risk of borrowing by individual borrowers, some of whom are risky? It's the lenders who should take on the risk. Pretending there's a magic solution is not the answer." Mr King stressed that it was no longer liquidity in the banking system that was the major issue in mortgage funding and other lending, but the capital adequacy and lending policies of individual institutions. He said: "The Bank can't provide funding to finance investment. That has to come from mobilising savings in the economy at home or abroad to fund investment: that's what the financial sector is there to do." Mr King's scepticism echoes that in the recent interim review of the mortgage market by the banker Sir James Crosby for the Treasury. Sir James, a former HBOS chairman, wrote to Mr Darling: "I may yet recommend that the Government should not intervene in the market, on the grounds that such intervention would create more problems than it would solve." The Bank also painted a gloomy picture for the construction industry as a result of the correction in the housing market and the general slowdown in the economy, predicting that, if housing starts remain at their present depressed level, that could reduce economic growth by between a quarter and a half percentage point. But the Governor also highlighted the way the credit crunch has left some people relatively unscathed in terms of the cost of borrowing. "It's the riskier borrowers who are finding it more expensive," he said. "That's where the credit crunch is hitting. It hasn't had an enormous impact on those people who are much safer borrowers. That's what you would expect. "We are moving from the imprudent period of excessive lending back to a period now of much more cautious lending." Divorce is rarely an easy process. But falling home values and sluggish real estate sales are combining to make it particularly difficult right now. Couples aren't fighting over who gets to keep the house. They're scrambling to get away from the burden of it. It's too soon to see the trend reflected in official statistics; the most recent marriage and divorce numbers compiled by the National Center for Health Statistics date back to 2005 -- just when real estate markets started to turn down from their boom years. But lawyers and financial planners anecdotally say they are seeing more clients stay married -- if only for the time being -- simply because they cannot afford to break up. "Truthfully, it's a mess," says Carol Chumney, an attorney who practices family law in Memphis, Tenn. "There are a lot of folks who want to get a divorce, and the house is an impediment because nobody wants it." The tough housing market is hitting divorcing couples in several ways. If the home's value has fallen below the amount owed on the mortgage, neither spouse wants to be saddled with that liability. If one wants to keep the home, it's difficult to refinance the mortgage so the departing spouse can be cut loose from the debt. And evaporating home equity can take with it the means to pay lawyers for the divorce itself. Dan Couvrette, chief executive officer of Divorce Marketing Group, a Canadian company that publishes Divorce Magazine, says he's also hearing anecdotally that some couples cannot afford to divorce now. "One of the ways they pay their legal fees is by selling or refinancing their home, and selling the home is getting more difficult," he says. Bonnie Hughes, a Certified Financial Planner with The Enrichment Group in Miami, is living through the situation herself. Two years ago, when she and her husband divorced, he kept their vacation house by a Tennessee lake, and she retained their main residence, a 3,000 square-foot home in Chattanooga, Tenn. He was able to sell the house at the lake; she was unable to get rid of what had been the family home. "I was planning on just selling it," Hughes says. "I had already moved to Atlanta." Even though the asking price is almost $100,000 lower than they had paid for it, the house in Chattanooga remains unsold at a list price of $329,000. "It's in inventory with homes that are just like it," she says. A renter helps pay the mortgage, but Hughes still has to contribute to the mortgage payment each month, even though she has moved on again, from Atlanta to Miami. Fortunately, she and her ex-husband have maintained an amicable relationship. Although she pays the full amount, he has allowed his name to remain on the mortgage so she doesn't have to refinance out of the 4.8 percent fixed-rate mortgage they had obtained while together. Of course, not all divorcing couples are able to get along well enough to minimize their losses in a depressed housing market. "A lot of times both of them cannot agree on what to do," says Chumney. "It can be a huge financial mess. In the past, a lot of times, folks wanted to keep the house, and lately, that's not the case." Some spouses simply dump the problem -- the home with a shrinking value -- on their soon-to-be-ex. "They just leave," says Chumney. "They move out and they're gone." The remaining spouse may have few options but to move out and try to rent the home, assuming that brings in enough to keep up with the payments. Or the home could be lost to foreclosure. If left-behind spouses try to keep their homes, they face legal bills when they try to get the departing spouses to approve sales. "Every time your lawyer goes to court, you're paying for the lawyer's time, and some of these people don't have the money," says Chumney. The divergence between underlying fundamental developments and market trading dynamics became only more striking this week. July Consumer Prices were reported up 5.6% from a year earlier, the largest y-o-y increase since January 1991. July Import Prices were up a record 21.6% y-o-y (data going back to 1982). Despite much worse-than-expected inflation readings, the bond market rallied Thursday. Understandably, the market is rather confident the Fed will ignore inflationary pressures as long as employment trends remain weak. And weak they were. Thursday's report had Continuing Claims for unemployment jumping another 114,000 last week to 3.417 million - the highest level since November 2003. Continuing Claims were up a notable 320,000 in three weeks, increasing the y-t-d gain to 727,000. The Treasury market is similarly content to disregard what will now be massive ongoing supply of new government debt issues. The federal deficit surged to a record $102.8 billion during July. Spending for the month was up 27.2% y-o-y, pushing fiscal y-t-d spending growth to a positive 8.5%. Receipts were down 5.8% from last July, with fiscal y-t-d Receipts now running 1.0% below a year ago. With two months to go, the fiscal y-t-d deficit has surged to $371bn, up sharply from last year's comparable $157bn. And despite troubling developments in the Caucasus and heightened geopolitical tensions, the energy and commodities rout ran unabated. Sure, the global economy is slowing. Yet the dramatic price moves being witnessed are indicative of panic liquidations. It is now clear that many within the leveraged speculating community have suffered huge losses over the past few weeks. For a "community" that was already suffering a difficult year, blowups in the popular energy, commodities and short dollar trades were a decisive backbreaker. Huge rallies in heavily shorted stocks and sectors have added further pain. One can now expect major redemptions at quarter and year-ends, a dynamic that likely ensures recent near-chaotic market conditions become the norm for awhile. I could go on and on with a discussion on deteriorating fundamentals. The economy is rapidly sinking into what will prove a deep and protracted downturn. Mortgage problems are broadening and worsening, ushering in another leg of financial system and housing market tumult. Financial sector spreads widened meaningfully again this week, and it is worth noting that American Express issued 5-year debt this afternoon at an eye-opening 425 bps above Treasuries. Fannie and Freddie debt spreads also widened significantly this week, as did benchmark agency MBS spreads. A severe Credit crunch is now tightening its noose around much of the real economy. But, for now, fundamentals are not driving market prices. As I wrote last week, markets are about Greed and Fear - and right now Fear Dominates. Those that crowded into the crowded energy and commodities trade are having their heads handed to them. It is also my sense that the scores of long/short funds are likely struggling as well, as many popular longs are performing poorly and popular shorts are in many cases rising spectacularly. The proliferation of "market neutral" and "quant" strategies created too many players all working cleverly to play the same game. Those ranks will be thinned over the coming months. Today's Wall Street Journal chronicled the pain suffered by one particular hedge fund. Launched in September 2006 by a hot UBS Trader, the fund immediately raised $3.0 billion. Performance has not met expectations. The fund dropped 34% in 2007 and was down 77% y-t-d through July. Worse yet, investors had agreed to up to a five year lockup. So, even the small amount of their remaining investment is inaccessible. A lot has been written about all the crazy mortgage and derivative products that were peddled during the Bubble. The incredible mania that engulfed the hedge fund community has not yet received it due. It's simply hard to believe the days of new fund managers raising billions with extended lockups isn't coming to an abrupt end. And this is an industry that has for the past few years luxuriated in enormous investment inflows. While I still read articles noting increased hedge fund investments (see "Muni Watch" above), I can't believe the more sophisticated money is not running or at least considering heading for the exits. At the minimum, the industry appears to have passed a major inflection point, and one should contemplate that acute Ponzi dynamics could easily materialize. As long as the industry was posting strong returns, inflows remained predictably huge. And robust flows ensured that favored positions could be increased and additional leverage employed - self-reinforcing bull market dynamics. These inflows worked to mark up the value of previous investments, as global securities and commodities markets soared. Investors were completely enamored, while "genius" fund managers raked in billions. This Bubble will not function well in reverse. And I know the argument that most hedge funds are still outperforming the major equities indices. This just doesn't matter much. I expect the entire dynamic of this industry to change now that the majority of funds face "high water marks" (losses that have to be recovered before incentive fees can again be collected). After suffering losses, many managers will be tempted to role the dice with investors' money: "Heads I win and get my head above the high water mark; tails investors lose and I close the fund and enjoy time at the beach." More responsible managers will operate under intense pressure for performance, forced to place bets but with little room for error. This is a particularly grueling endeavor, and you can rest assured that markets won't cooperate. Such significantly altered trading dynamics - not to mention all the burst global speculative Bubbles - create a backdrop where it becomes extremely difficult for speculators to perform. And resulting wild market volatility significantly compounds the pressure and angst. At the same time, many managers had expected to implement various strategies to play the markets' downside - including shorting, buying put options, writing calls, and certainly playing CDS and various other derivatives. Yet because the Global Leveraged Speculating Community ballooned to unimaginable dimensions, these various systemic "hedges" and bearish speculations all became One Big Crowded Trade. Things are just not going work as expected, a huge problem for investors with grossly inflated expectations. Wall Street and global speculator community travails are today at the heart of Acute Monetary Disorder. Global pricing mechanisms have turned dysfunctional. Crude oil, the most important commodity in the world, now sees its price fluctuate 30% over a few short weeks - to the upside and then to the downside. Currency values have become similarly unhinged. At the same time, liquidity conditions throughout the global debt markets have turned quite spotty at best. All these factors are working corrosively on the global economy. The consensus view is that the Fed should maintain today's (grossly inequitable) negative real interest rates indefinitely. This, as the thinking goes, is how the financial sector will repair itself. Everything will then return to normal - eventually. Besides, inflation's won't be much of an issue. I contend that global financial and economic systems will not begin to "normalize" until this massive global pool of speculative finance deflates. Speculators have for some time been the marginal price setters for global securities, energy, commodities and many other asset markets. This is a precarious dynamic, especially considering that large numbers of speculators are impaired and will now be fighting to save their businesses. Things both financial and economic have become hopelessly unstable. And this Dysfunctional Pricing Backdrop has become the major impediment to unavoidable U.S. and global economic adjustment. So, you think you are safe from that predatory collection agency that is trying to collect (extort) thousands of dollars from you for an old, disputed debt that isn’t even enforceable? Well, think again. The collection agencies that specialize in purchasing time-barred debts, have a powerful ally: banks and mortgage companies. And guess what? Banks and mortgage companies do not care about your rights. What you are experiencing is a phenomenon known as “Zombie Debt” collection which is more frightening than a typical horror movie. The term “Zombie Debt” was derived from collection agencies practice of bringing old, long forgotten debts “back to life from the dead” via renewed collection efforts. These debts are typically purchased by collection agencies or other debt buyers for cents on the dollar or less. Often times, “Zombie Debts” are disputed or fraudulent debts that were sold or transferred after resolution. Sometimes the debts were valid, but the balances are grossed overstated. Occasionally, the debts were discharged in bankruptcy. Usually, however, the debts are unenforceable due to being past the Statute of Limitations- which is why they are so cheap. Because old debt can be purchased on the cheap, the risk to reward is very attractive to skilled collectors that are unconcerned with trivial matters such as whether the debts are valid and enforceable. This is because skilled collectors know they can prey on the ignorance of consumers and lenders to obtain (extort) payment. As an example, I recently closed a sale transaction where the lender required the buyer to pay disputed collection accounts on time-barred debts in order to obtain financing. The buyers, unfortunately, chose homeownership over their legal rights (against my advice), and were bilked out of over $5,000 from predatory collection agencies who were flagrantly violating the Fair Credit Reporting Act (FCRA) and Fair Debt Collections Practices Act (FDCPA). In this case, not only were the debts legitimately disputed, but they were past the Statute of Limitations, legally unenforceable, and were less than a year away from dropping off the borrower’s credit report for good. Furthermore, the collection agencies never provided acceptable debt validation or justification for demanding over twice the original debt which is a violation of the FDCPA. The cherry on top was the collection agencies refusal to provide the original delinquency dates to the credit bureaus in an attempt to extend the reporting of the accounts and conceal that the Statute of Limitations had expired. All of this was, of course, documented in the file and addressed in the borrower’s letter of explanation. To make matters worse, the lender refused to allow the borrowers to have the account resolution and payment handled through a licensed, HUD approved, debt management service instead of an unskilled escrow company. As a result, the payoffs were handled improperly which will likely result in renewed liability for the borrower, possible future judgment, extended reporting and probable resell of disputed amounts to other debt buyers. Why? Because making payment on time-barred debts resets the Statute of Limitations and possibly the reporting period. If the creditor feels that the payment is insufficient, they are empowered to pursue the deficiency from the courts. Adding insult to injury, because of the collection agencies success in collecting (extorting) amounts from the consumer, their collection “score” will actually go up which could generate lead triggers to other agencies (yes, the credit bureaus all sell products that aid collection agencies in targeting consumers). At this point, you may be scratching your head in confusion as to why banks and mortgage companies would side with the debt collectors rather than looking out for the best interests of their customer, the borrower. Without putting on a tin-foil hat and exploring “conspiracy theories”, the explanation is simple, IGNORANCE. Unfortunately, the advent of automated underwriting has resulted in an overall dumbing down of the industry, and many underwriters think the abbreviation for the Statute of Limitations (SOL) stands for something entirely different. Needless to say, the problem boils down to the simple fact that lender’s are simply unwilling to provide appropriate training to their staffs. As any professional in the industry knows, most lender’s criteria for whether collections or charge-offs must be paid are typically arbitrary and have absolutely no bearing on the law or borrower’s rights. As an example, some lenders require payment of collections and charge-offs when the aggregate balance is over a certain amount- say $2,000 to $5,000. Some will base the decision on the age of accounts and whether or not they are medical in nature. Others will rely on whether their automated underwriting system (AUS) requires payment. Although FHA, VA, FNMA, and FHLMC base their requirements for debt payoffs on potential recourse and do not require payment of legally unenforceable debts where there is a bona fide dispute or legitimate legal defense- including whether the debts are time-barred. Yet, lenders will often blame these agencies for requiring payoff. While this case may seem unique, it is not. With lender’s stiff-arming borrowers to pony up and pay these collection agencies, the industry growth has been quite extraodinary. According to account receivable management (ARM) expert Kaulkin Ginsberg, expected revenues for the debt buying industry will grow from $3.7 billion in 2006 to 6.2 billion by 2011. According to the Federal Trade Commission in their 2008 Annual Report on the Fair Debt Collection Practices Act, more than 26.69% of total complaints received by the Federal Trade Commission in 2007 were for purported violations of the Fair Debt Collection Practices Act (FDCPA). Of these complaints, more than 77% were against third party collectors, and over 30% were against collectors demanding more than legally permitted. While the courts have held that the FDCPA doesn’t prohibit creditors from attempting to collect time-barred debts, it does prohibit deceptive practices such as threatening to take legal action or misrepresenting their enforcement rights. Furthermore, the Fair Credit Reporting Act (FCRA) requires that the creditor report the actual month and year of the original delinquency to the credit bureaus. Regardless of whether a debt is time-barred, the account can still be reported for seven years (from the date of original delinquency). Nonetheless, the FDCPA prohibits the attempted collection of any debt that was discharged in bankruptcy. While the FTC will take your complaint for violations of the FCRA and FDCPA, don’t expect anything in return for your time other than a form letter. The FTC doesn’t investigate individual complaints, but moreover, investigates aggregate complaints. The complaints also aid them in compiling statistics for their annual report. While the FTC will take action against companies with excessive complaints, such as NCO Financial who was fined $1.5 million in 2004, its of little solace to those who have been victimized by abusive collection practices. Considering that most civil penalty fines are typically small compared to the profits, fines provide little deterrent and are typically factored as a cost of doing business. The legal system is often of little help because the penalties for violations of the FDCPA and FCRA typically range between $1000 to $2,500 per incident which is why the legal industry isn’t doing back-flips over the flagrant abuses made by the collection industry who have legal resources above and beyond the comprehension of the average consumer. Another disturbing trend is increase of collection agencies turning to the legal system in an attempt to collect time-barred debts. In a recent story, the Chicago Tribune detailed how debt collectors were clogging the Cook County Circuit Court with more than 119,000 civil lawsuits, and how cases had doubled in one courtroom from just two years ago. This is problematic for consumers because most cases are heard in small claims court where consumers cannot have legal representation, and may not be aware of having a legitimate Statute of Limitations defense. As for what consumers can do to protect themselves, first and foremost is to pay your bills when they are due, and maintain proof. Next is to seek legal advice. In the event of a dispute, communicate in writing, and use certified mail if possible. Additionally, do not discard evidence regardless of whether the Statute of Limitations has expired. Whenever contacted by a credit agency, immediately request validation in writing via certified mail. If the debt is erroneous, notify the agency and the credit bureaus that the debt is disputed and provide documentation or other information. If contacted by a legal firm, immediately seek legal advice. As always, stay on top of your credit report and understand that it may take numerous requests and disputes before the credit bureaus finally report the accounts correctly. Understand that lenders may require that you pay off collections if you wish to purchase a home or refinance, and that you should always obtain a written settlement agreement releasing you of further liability whenever you pay a collection- especially on a reduced settlement. As to industry professionals, the best practice is to put the borrower first, and understand that arbitrarily requiring payment of disputed and time-barred debts is abusive and actually subjects the borrower (and lender) to greater risk. If the debts must be paid despite a documented dispute, consider payment through a qualified debt management and settlement company who can assist the borrowers in receiving settlement letters and releases, and ensure that the accounts are reported properly after settlement. Understand that the borrower is the customer and not the collection agency. As such it is the borrower’s well-being which should be the most important. Please note that I am not an attorney and am not providing legal advice, but moreover, a wake up call for the industry. Ilargi: I’ve noted this before: the media, in this case the New York Times, are playing a new game. Nouriel Roubini is being painted as the most pessimistic commentator on the US economy, at precisely the moment when he no longer is. A while back, I put his predictions of a 30% drop in home prices face to face with Meredith Whitney’s assertion that a 33% drop was too low to even be mathematically possible. Say what you will, but that does not fit the Dr. Doom label. But rest assured, the mainstream media have found their new anchor of negativity. That way they don’t need to report on bleaker visions such as Whitney’s. Roubini is as dark as it will get in the press. He even very conveniently looks the part, apparently: "I’m not a pessimist by nature,” he insisted. “I’m not someone who sees things in a bleak way.” Just looking at him, I found the assertion hard to credit." Roubini will lose all credibility in the process, unless he wisens up and gets away from reporting with an agenda soon. On Sept. 7, 2006, Nouriel Roubini, an economics professor at New York University, stood before an audience of economists at the International Monetary Fund and announced that a crisis was brewing. In the coming months and years, he warned, the United States was likely to face a once-in-a-lifetime housing bust, an oil shock, sharply declining consumer confidence and, ultimately, a deep recession. He laid out a bleak sequence of events: homeowners defaulting on mortgages, trillions of dollars of mortgage-backed securities unraveling worldwide and the global financial system shuddering to a halt. These developments, he went on, could cripple or destroy hedge funds, investment banks and other major financial institutions like Fannie Mae and Freddie Mac. The audience seemed skeptical, even dismissive. As Roubini stepped down from the lectern after his talk, the moderator of the event quipped, “I think perhaps we will need a stiff drink after that.” People laughed — and not without reason. At the time, unemployment and inflation remained low, and the economy, while weak, was still growing, despite rising oil prices and a softening housing market. And then there was the espouser of doom himself: Roubini was known to be a perpetual pessimist, what economists call a “permabear.” When the economist Anirvan Banerji delivered his response to Roubini’s talk, he noted that Roubini’s predictions did not make use of mathematical models and dismissed his hunches as those of a career naysayer. But Roubini was soon vindicated. In the year that followed, subprime lenders began entering bankruptcy, hedge funds began going under and the stock market plunged. There was declining employment, a deteriorating dollar, ever-increasing evidence of a huge housing bust and a growing air of panic in financial markets as the credit crisis deepened. By late summer, the Federal Reserve was rushing to the rescue, making the first of many unorthodox interventions in the economy, including cutting the lending rate by 50 basis points and buying up tens of billions of dollars in mortgage-backed securities. When Roubini returned to the I.M.F. last September, he delivered a second talk, predicting a growing crisis of solvency that would infect every sector of the financial system. This time, no one laughed. “He sounded like a madman in 2006,” recalls the I.M.F. economist Prakash Loungani, who invited Roubini on both occasions. “He was a prophet when he returned in 2007.” Over the past year, whenever optimists have declared the worst of the economic crisis behind us, Roubini has countered with steadfast pessimism. In February, when the conventional wisdom held that the venerable investment firms of Wall Street would weather the crisis, Roubini warned that one or more of them would go “belly up” — and six weeks later, Bear Stearns collapsed. Following the Fed’s further extraordinary actions in the spring — including making lines of credit available to selected investment banks and brokerage houses — many economists made note of the ensuing economic rally and proclaimed the credit crisis over and a recession averted. Roubini, who dismissed the rally as nothing more than a “delusional complacency” encouraged by a “bunch of self-serving spinmasters,” stuck to his script of “nightmare” events: waves of corporate bankrupticies, collapses in markets like commercial real estate and municipal bonds and, most alarming, the possible bankruptcy of a large regional or national bank that would trigger a panic by depositors. Not all of these developments have come to pass (and perhaps never will), but the demise last month of the California bank IndyMac — one of the largest such failures in U.S. history — drew only more attention to Roubini’s seeming prescience. As a result, Roubini, a respected but formerly obscure academic, has become a major figure in the public debate about the economy: the seer who saw it coming. He has been summoned to speak before Congress, the Council on Foreign Relations and the World Economic Forum at Davos. He is now a sought-after adviser, spending much of his time shuttling between meetings with central bank governors and finance ministers in Europe and Asia. On a cold and dreary day last winter, I met Roubini over lunch in the TriBeCa neighborhood of New York City. “I’m not a pessimist by nature,” he insisted. “I’m not someone who sees things in a bleak way.” Just looking at him, I found the assertion hard to credit. With a dour manner and an aura of gloom about him, Roubini gives the impression of being permanently pained, as if the burden of what he knows is almost too much for him to bear. He rarely smiles, and when he does, his face, topped by an unruly mop of brown hair, contorts into something more closely resembling a grimace. When I pressed him on his claim that he wasn’t pessimistic, he paused for a moment and then relented a little. “I have more concerns about potential risks and vulnerabilities than most people,” he said, with glum understatement. But these concerns, he argued, make him more of a realist than a pessimist and put him in the role of the cleareyed outsider — unsettling complacency and puncturing pieties. As a graduate student at Harvard, Roubini was an unusual talent, according to his adviser, the Columbia economist Jeffrey Sachs. He was as comfortable in the world of arcane mathematics as he was studying political and economic institutions. “It’s a mix of skills that rarely comes packaged in one person,” Sachs told me. After completing his Ph.D. in 1988, Roubini joined the economics department at Yale, where he first met and began sharing ideas with Robert Shiller, the economist now known for his prescient warnings about the 1990s tech bubble. The ’90s were an eventful time for an international economist like Roubini. Throughout the decade, one emerging economy after another was beset by crisis, beginning with Mexico’s in 1994. Panics swept Asia, including Thailand, Indonesia and Korea, in 1997 and 1998. The economies of Brazil and Russia imploded in 1998. Argentina’s followed in 2000. Roubini began studying these countries and soon identified what he saw as their common weaknesses. On the eve of the crises that befell them, he noticed, most had huge current-account deficits (meaning, basically, that they spent far more than they made), and they typically financed these deficits by borrowing from abroad in ways that exposed them to the national equivalent of bank runs. Most of these countries also had poorly regulated banking systems plagued by excessive borrowing and reckless lending. Corporate governance was often weak, with cronyism in abundance. Roubini’s work was distinguished not only by his conclusions but also by his approach. By making extensive use of transnational comparisons and historical analogies, he was employing a subjective, nontechnical framework, the sort embraced by popular economists like the Times Op-Ed columnist Paul Krugman and Joseph Stiglitz in order to reach a nonacademic audience. Roubini likens his style to that of a policy maker like Alan Greenspan, the former Fed chairman who was said (perhaps apocryphally) to pore over vast quantities of technical economic data while sitting in the bathtub, looking to sniff out where the economy was headed. Roubini also cites, as a more ideologically congenial example, the sweeping, cosmopolitan approach of the legendary economist John Maynard Keynes, whom Roubini, with only slight exaggeration, calls “the most brilliant economist who never wrote down an equation.” The book that Roubini ultimately wrote (with the economist Brad Setser) on the emerging market crises, “Bailouts or Bail-Ins?” contains not a single equation in its 400-plus pages. After analyzing the markets that collapsed in the ’90s, Roubini set out to determine which country’s economy would be the next to succumb to the same pressures. His surprising answer: the United States’. “The United States,” Roubini remembers thinking, “looked like the biggest emerging market of all.” Of course, the United States wasn’t an emerging market; it was (and still is) the largest economy in the world. But Roubini was unnerved by what he saw in the U.S. economy, in particular its 2004 current-account deficit of $600 billion. He began writing extensively about the dangers of that deficit and then branched out, researching the various effects of the credit boom — including the biggest housing bubble in the nation’s history — that began after the Federal Reserve cut rates to close to zero in 2003. Roubini became convinced that the housing bubble was going to pop. By late 2004 he had started to write about a “nightmare hard landing scenario for the United States.” He predicted that foreign investors would stop financing the fiscal and current-account deficit and abandon the dollar, wreaking havoc on the economy. He said that these problems, which he called the “twin financial train wrecks,” might manifest themselves in 2005 or, at the latest, 2006. “You have been warned here first,” he wrote ominously on his blog. But by the end of 2006, the train wrecks hadn’t occurred. Recessions are signal events in any modern economy. And yet remarkably, the profession of economics is quite bad at predicting them. A recent study looked at “consensus forecasts” (the predictions of large groups of economists) that were made in advance of 60 different national recessions that hit around the world in the ’90s: in 97 percent of the cases, the study found, the economists failed to predict the coming contraction a year in advance. On those rare occasions when economists did successfully predict recessions, they significantly underestimated the severity of the downturns. Worse, many of the economists failed to anticipate recessions that occurred as soon as two months later. The dismal science, it seems, is an optimistic profession. Many economists, Roubini among them, argue that some of the optimism is built into the very machinery, the mathematics, of modern economic theory. Econometric models typically rely on the assumption that the near future is likely to be similar to the recent past, and thus it is rare that the models anticipate breaks in the economy. And if the models can’t foresee a relatively minor break like a recession, they have even more trouble modeling and predicting a major rupture like a full-blown financial crisis. True though this may be, Roubini’s critics do not agree that his approach is any more accurate. Anirvan Banerji, the economist who challenged Roubini’s first I.M.F. talk, points out that Roubini has been peddling pessimism for years; Banerji contends that Roubini’s apparent foresight is nothing more than an unhappy coincidence of events. “Even a stopped clock is right twice a day,” he told me. What economic developments does Roubini see on the horizon? And what does he think we should do about them? The first step, he told me in a recent conversation, is to acknowledge the extent of the problem. “We are in a recession, and denying it is nonsense,” he said. When Jim Nussle, the White House budget director, announced last month that the nation had “avoided a recession,” Roubini was incredulous. For months, he has been predicting that the United States will suffer through an 18-month recession that will eventually rank as the “worst since the Great Depression.” Though he is confident that the economy will enter a technical recovery toward the end of next year, he says that job losses, corporate bankruptcies and other drags on growth will continue to take a toll for years. Roubini has counseled various policy makers, including Federal Reserve governors and senior Treasury Department officials, to mount an aggressive response to the crisis. He applauded when the Federal Reserve cut interest rates to 2 percent from 5.25 percent beginning last summer. He also supported the Fed’s willingness to engineer a takeover of Bear Stearns. Roubini argues that the Fed’s actions averted catastrophe, though he says he believes that future bailouts should focus on mortgage owners, not investors. "Recessions are signal events in any modern economy. And yet remarkably, the profession of economics is quite bad at predicting them. " LOL!!! no, really? I DO continue to be astonished, fool that I am, at how many hundreds of times statements identical to that ARE made by the mainstream folks- and YET- the very next day, they continue to expect "the profession" of economics- to provide useful information. Oh, my. In all fairness. My own "science" - biology/ecology- has been grossly inflated in the past 50 years, also. The universities are now full of unqualified PhDs, pontificating right and left, with mind-boggling ignorance and inaccuracy. I'm far from alone in this opinion- my top professor friends agree; and we really don't know what to do about it. Part and parcel of the impending collapse? The piece about folks beginning to loose it mentally when the final eviction notice/sheriff is at the door is only the beginning of what we will start to witness as more and more regular folks find themselves at the end of their rope...with nothing but a long fall ahead. There once was a safety net ,of a sort,both social and governmental,that,although not perfect,did keep most folks from going off the deep end. Its not like that now...no net...If you fall ,you go all the way down.Some people flat can't stand it.Loss of EVERYTHING means loss of even the will to live. I am surprised we have not seen more "postal" events.I expect to see a lot more,as this "discontinuity" in the [worlds]American financial system continues,we are going to have a lot of people looking for "those to blame"When eating dogfood,and sleeping alone in a tent. Here's a link to a piece from about a month ago on the inability of economists to predict recessions and worse Crunchonomics: What The Econophysicists Say. My comment on the article is at the bottom of the page. Stoneleigh- I took a quick look (insanely busy just now.) It looks like you didn't waste your time! LeRoy may start paying attention. I'm kicking my self just a bit because I know I've seen your references here to herding behavior as a predictor- and I didn't quite pick up on it. No wonder I find myself in agreement with you guys so often! My formal studies included a lot of ethology- and I also have come to use human herding behaviors as major predictors, without reference to other workers. Heck yes. It works. Better than anything else we've got at the moment. My early academic background was probably quite similar to yours. As a biology student I was particularly interested in both ecology and neuroscience, with a fair amount of psychology thrown in for good measure. Crowd psychology fascinates me. It's an emergent property at the population level with its own internal dynamics - dynamics that are vital to understanding all human systems, including markets. If you're interested, you could check out the documentary History's Hidden Engine. You can download it for free from the socionomics website I linked to.